A New Frontier: Sewing | Barbie Who? Wow, what a summer it has been for us. As I have said before, my family recently moved south. Moving is always a challenge, and there are always casualties along the way. This time around, my sewing machine was the biggest loss. It was a Europro I had bought at a thrift store. I think I spent $25 for it and another $35 to have it serviced and a part replaced. The people at the repair shop said it was a fairly new machine and would have cost $350 if I had bought it from their shop. I rolled the dice and would up winning with this thrift store find. It was a solid machine and it served me well for many years; I was sad to see it go. The movers did pack it well, but the box it was packed in was crushed under something heavier. This caused some bending of the case and some of the machinery inside. It made a terrible crunching sound after I powered it back up, and it was at that moment I knew it was beyond repair. The moving company paid out a little over $100 for the value of the machine. Isn’t it fun how insurance works? It pays for how much they think the item is worth and not how much it would cost to replace it. While I certainly got my money’s worth out of the machine, I was shocked by the various options and prices for a replacement. Do I want to spend $1,000 for a good quilting machine? Do I want to thrift a new machine and roll the dice again? What brand do I want? Mechanical or computerized? Where will I get the best deal? There were so many considerations. I didn’t take this decision lightly. I researched different types of machines, different brands, and other factors. 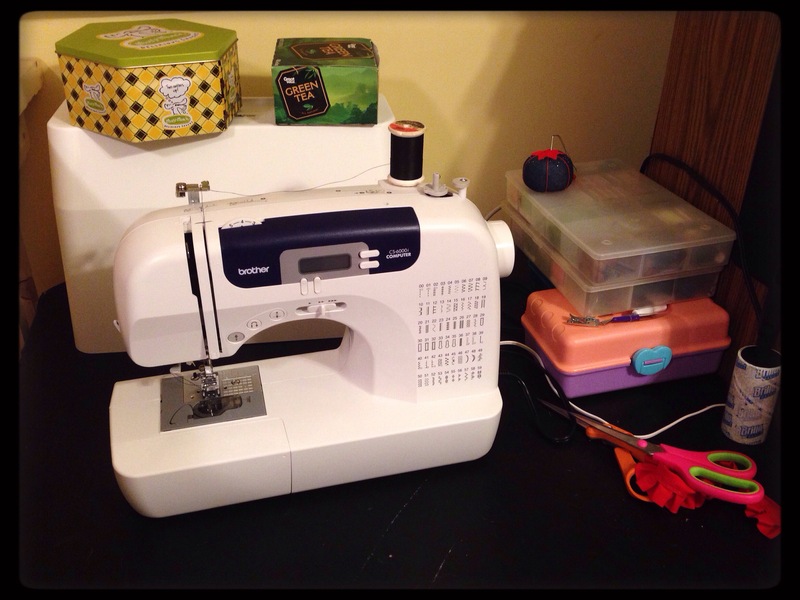 I decided that I didn’t do enough sewing to buy an extravagant machine. I didn’t want to spend a large amount of money on an expensive new machine because we will likely be moving several more times during the lifetime of the machine (it’s just a reality of my husband’s career). I wanted something that meets somewhere between quality and affordability. I narrowed it down to a few machines I was interested in, and then I went to a local sewing shop. The lady at the shop was very nice. She showed me several machines and gave her opinion on them. I told her my needs, and she said that a Brother machine would probably be best for my needs as an occasional seamstress. She showed me several models, and in the end I spent $150 on a Brother CS-6000i. This model has been out for several years, and it seems reliable. It has so many positive reviews; people seem to enjoy it. The lady at the shop said that she often sells this as a starter machine because it travels well (for going to and from sewing classes) and it can do a little bit of everything. She said she wouldn’t recommend making a large quilt on it, but it can do smaller projects. This fits me very well. I was impressed with the various feet and accessories it came with, too. I have used exactly 2 of them, but it’s nice to know they’re there if I ever need them. I saw a beautiful quilted pot holder on Ericka Eckles’ blog, and I would love to tackle that type of project with this machine. I am currently making drapes for our new home, and I hope to use scraps from that project to attempt a potholder of my own. We shall see how it goes! Over the last few weeks, I have used the machine for some minor hemming and curtains. It is a nice machine, and I look forward to using it in my home and beyond. 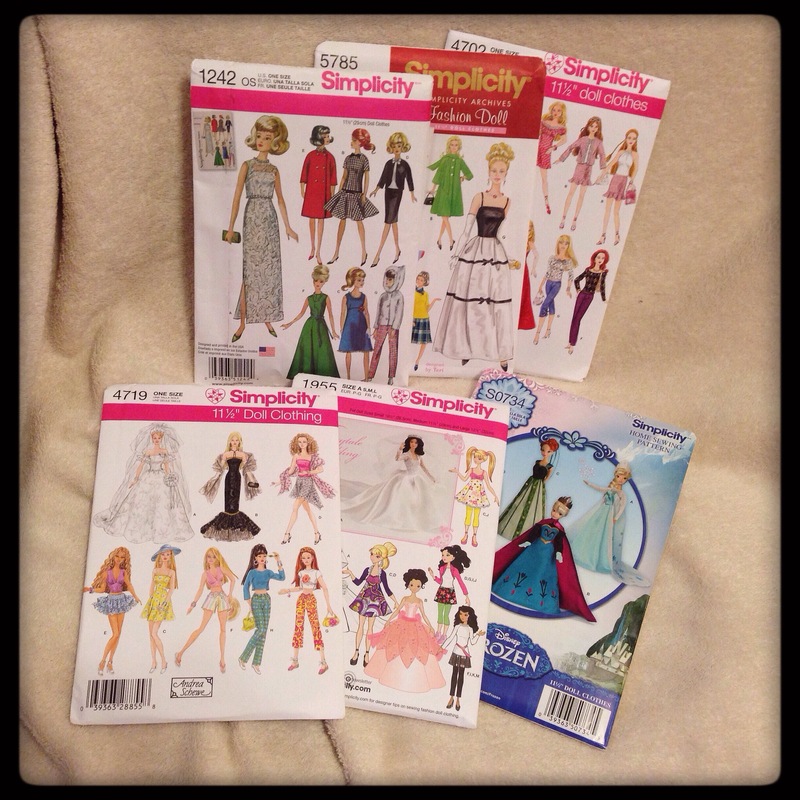 One thing I learned from chatting up other bloggers is that you can buy sewing patterns for 11-1/2″ fashion dolls. I looked online, and I made a short list of the different patterns currently offered by the main pattern manufacturers. Then I waited. I have been around craft stores long enough to know that most patterns will go on sale for $1-$2 every few weeks, so it is just a matter of time for them to become affordable. Last week, my luck struck! Hancock Fabrics had a 5 for $5 sale on Simplicity patterns, so I went there to stock up! It was my first time at their store, and I was happy with the experience. I was able to pick up all the patterns I wanted at an excellent price. That is a total MSRP of $96.70, and I paid $6.00 for them all. That is a 94% savings. I feel like a savings ninja! Pattern sales truly are the only way to buy patterns. I don’t see how any seamstress could afford them otherwise. As of right now, I plan on using the pants and jacket from Simplicity 1242 for the second Ood outfit. I think that it would be interesting to have two outfits that are stylistically the same but made from two different mediums. It should also be much faster to sew an outfit than it is to knit an outfit, too. This will help me finish the Ood dolls and move on to something else. Right now, I feel like a wedding is calling me. I have many patterns from my mom that could apply to a wedding scene…. It is so, so tempting. I’ll try not to get too far ahead of myself, though. I need to focus on one character and one outfit at a time. Currently, I am making solid progress on the knit Ood jacket. I hope to have it finished this week! With some luck, I should have it posted next week. I am excited for how it looks, but I also know that I am about to tackle the hardest part of the pattern. Hopefully the sleeves and the neck area will go smoothly. I look forward to sharing the next update. Until then, I hope you have a fantastic day. Fantastic! I will remember that as I venture into sewing for dolls. Sorry to hear about the last machine 😦 but congrats on the next one, let’s hope it copes with the pressures of moving! I have a sewing machine which I picked up cheap years ago, but it’s rubbish – it’s almost impossible to thread up. At first I thought it was just me but I read reviews and it’s a common problem. It’s a great thing to be able to sew, I’ll have to get a decent one, one day. It would save so much time. Congrats on your patterns too. Just bear in mind that most of them are designed for the old-style body with a broader chest and narrower waist (maybe all of them, I don’t recognise some of them). If you sew for newer dolls, sometimes they need a bit of alteration, I’ve found. Sewing machines can really be hit or miss. My mom has an old singer that I always had problems with, and when I looked it up online people had nicknamed it the ‘sew and swear’. I’m glad I talked to the lady at the local shop to find one that is more user friendly. Hopefully you can find a machine that’s a better fit one day.